Pristine-M process technology for the drying of the low rank coals is being developed by Clean Coal Technologies, Inc. (CCTI). It is a patented technology for converting raw low rank coal into a cleaner burning more efficient fuel. It addresses the need for a low moisture coal which is economical to transport, stable in transportation and does not reabsorb moisture. 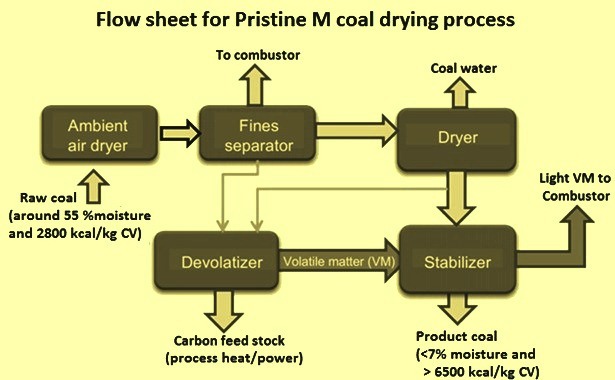 Pristine-M is a low-cost coal de-watering technology which has succeeded in drying coal and stabilizing it cheaply using volatile matter (VM) released by the feed raw coal. Pristine-M process reduces the moisture content of low-rank coals, while also stabilizing and sealing the treated coals to prevent moisture re-absorptions and spontaneous combustion. The process also increases the calorific value (CV) of the low-rank coals to values which are comparable with the bituminous coals. Pristine-M is the third stage of the development of the process. The other two stages are ‘Pristine-SA’ and ‘Pristine’. Pristine-SA is a development stage technology designed to eliminate 100 % of the VM in the feed raw coal. For achieving stable combustion, Pristine-SA treated coal is to be co-fired with treated biomass or natural gas. The process results into a clean fuel, eliminating the need for emissions scrubbers and the corollary production of toxic flue gas desulphurization (FGD) sludge. Pristine-SA gives a versatile coal product which can be used to produce numerous non-fuel products. CCTI’s legacy technology, ‘Pristine’, is designed to remove moisture and VM, as per the requirements. The factor determining VM reduction is boiler design and the need for a certain amount of VM to remain in the coal to ensure proper burn. The end product is a cleaner burning, dry coal. CCTI’s Pristine-M technology is a patented, low-cost coal dehydration technology. The Pristine-M process begins with the extraction of VM in liquid form from lower ranking coals. Once the moisture is removed from the targeted coal, the liquid volatiles are used through an ‘absorption’ process to fill the pores of the coal which have been dehydrated. The end result is an impermeable, stable coal with an upgraded CV content. This stable coal can be economically transported and used for coal-fired power plants. The Pristine-M process technology has been developed to address the pressing need for an economical way to de-water coals whose moisture content are high (30% – 60%), but where the reduction of VM is not needed or, if it occurs, it renders the VM too low for the coal to sustain combustion in a pulverized coal (PC) boiler. The new technology complements the existing Pristine-technology. It builds on the science that reinforces the Pristine-process and combines a unique concept known as ‘Vapour Phase Deposition’. CCTI has created facility in Oklahoma, USA during December 2015 for the validation of Pristine-M technology. The tests carried out at the facility has confirmed (i) successful dehydration of coal, (ii) successful beneficiation of coal (increase of the CV value), (iii) successful stabilization of coal, and (iv) successful production of a dust free, stable end product. The testing facility is now moved to Wyoming. The test facility has been designed and built as a prototype of the process at around 0.1 times the size of the commercial scale. CCTI’s process concepts are built on refining coal before use. Pristine-M technology strives to refine coal by removing pollutants from coal before its use. Doing so enables pollutants to be captured in their pure, undiluted state and in much smaller volumes for disposal or re-use elsewhere. The Pristine-M technology eliminates costly post-combustion pollutant removal technologies such as flue gas scrubbers and scrubber waste and reduce carbon emissions. Pristine-M process addresses three fundamental challenges associated with the drying of the coal. These challenges are (i) to produce a dried coal which does not re-absorb moisture, (ii) to produce a dried coal which does not has a tendency to become friable, resulting in excessive fines production so that it can be safely transported with minimal risk of spontaneous combustion, and (iii) the process to be inexpensive and economically viable. The process does not need pulverization of the raw feed coal. The treated coal retains most of its initial size distribution and suffers almost no degradation. Hence, the final product requires no briquetting or pelletizing. Pristine-M process is a continuous process comprised of three separate stages. These are (i) dryer, (ii) devolatizer, and (iii) stabilizer. The process utilizes a devolatizer to produce gases which are used for the process heat as well as to stabilize the dry coal. Only a small portion of the feed raw coal (typically less than 7 %) is devolatized. Process parameters are optimized so as to produce only enough volatile gases for the mentioned purposes. Liquid byproducts are not desirable in this process. Excess devolatized coal is blended back with the dry and stabilized coal at the end of the process and, thus, is not lost. The process flow sheet showing three stages are given in Fig 1. The first stage comprises a dryer using a technology to maintain optimal heat exchange with a minimal footprint. Drying takes place at around 120 deg C, a temperature which is adequate to drive off inherent moisture with the degree of removal, e.g., down to 15 % or 10 % or 5 %, being a function of residence time, bed depth and temperature. Certain coal types have a tendency to degrade into fines as a function of the degree to which the feed raw coal is dried. In such cases, the removal of moisture is reduced otherwise briquetting of dried coal is required. When excessive fines (coal particles with mean particle size <6 mm), are present in the feed coal, the fines can be processed separately or combusted to provide process heat, whichever option proves to be economically most feasible for the specific application. In the second stage of the process, a slip stream of the demoisturized coal from the dryer is (generally 5 % to 10 %) removed from the main flow and sent to a devolatizer. The devolatizer operates at 400 deg C to 450 deg C to devolatized the slipstream of coal. All evolved gases are sent to the third stage (the stabilizer), while all non-condensable gases are combusted for process heat. The process is optimized to produce only enough gases and vapours for process heat and for stabilizing the demoisturized coal. The product from the devolatizer can be blended back with the demoisturized and stabilized coal, if desired. In the third stage of the process which is the stabilization/ Vapour Phase Deposition phase, the VM is fed into a specially designed vessel which allows the VM to be absorbed into the pores of demoisturized coal from the first stage. Volatile vapours penetrate into coal pores vacated by the loss of moisture, as well as coat the surface of the coal. This action seals the surface of the coal, thereby preventing any moisture reabsorption, spontaneous combustion and any tendency to disintegrate. For achieving the desired result, stabilization parameters are established based on the chemical profile of the feed raw coal. The Pristine-M process makes the coal impermeable. Also the structural integrity of the coal is maintained and its heat value can be enhanced beyond the value achieved with only the removal of moisture. The Hardgrove Grindability Index (HGI) of the product coal remains the same as that of the feed coal. The dried coal does not have a tendency to break in transport and also has a shelf life long enough to sustain long-ocean or surface transportation and long periods in coal yards exposed to the elements. Samples of dried coal have survived for well over 6 months outdoors, unsheltered, without re-absorption of moisture. The Pristine-M process is modular. A commercial module which is designed to feed throughput of 30 tons per hour and handling feed raw coal with 50 % moisture has a capacity to produce around 160,000 tons of dry coal per year. A one million ton per year plant based on Pristine-M process is comprised of 6 such modules. The process is continuous with resident times estimated to be around 15 minutes, depending on the degree of moisture removal and the inherent moisture in the coal. The plant operates at the pressure of 1 atmosphere. The Pristine-M process modules are configured to operate independently and in parallel to each other, thereby allowing individual modules to be taken offline for scheduled /unscheduled maintenance or unplanned breakdowns without interruption to the other modules. Additional capacity, as and when required, is provided through additional modules. By incorporating commercially available off-the-shelf components, the design avoids the need for custom-built equipment which adds to the capital cost of the plant. The plant is controlled and operated through a sophisticated process control system. When there are significant variations in the feed coal (structural, chemical, or inherent moisture), the Pristine-M drying plant is designed to handle the different coals. The plant control system automatically adjusts for differences, within a limited range. It is also possible to run coals of different characteristics through the process simultaneously, using separate modules able to address the differences appropriately. The following are the advantages of the Pristine-M process. Process advantages – These include (i) low processing time which is between 5 minutes to 10 minutes, (ii) adjustable product specifications, (iii) variety of feed coals can be processed since there is process control and optimization through knowledge based programmable logic controllers (PLC), (iv) suitable for feed coal size of 0 mm to 50 mm, (v) process operates at atmospheric pressure, and (vi) the process has modular and scalable design. Product advantages – These include (i) there is no moisture re-absorption, (ii) there is no spontaneous combustion of product coal, (iii) there is no size degradation, (iv) the product coal is ideal gasifier feedstock, (v) the product coal has optimal level of VM to maximize combustion, (vi) The product coal is dust free thus reducing coal dust pollution when transporting coal, (vii) there is reductions in CO2 and hazardous pollutants, and (viii) low capital and operating costs.